A map highlighting the corners of the four Canadian provinces and territories which theoretically meet. The four corners of Canadian political subdivisions hypothetically meet at a point near 60°N 102°W. These are the provinces of Manitoba and Saskatchewan and the territories of the Northwest Territories and Nunavut. The four corners area is located between Kasba Lake to the north and Hasbala Lake to the south. It is located by an area of marginal taiga forest, which happens to be the only place in Nunavut which is not Arctic tundra or ice cap. It is hundreds of kilometres from any road or railway, but can be accessed from nearby Kasba Lake Airport/Water Aerodrome as well as from Points North Landing near Wollaston Lake. 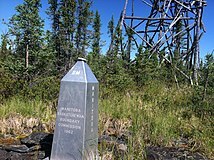 The intersection of the boundaries of Manitoba and Saskatchewan with NWT, surveyed before the creation of Nunavut in 1999, is marked by a metre-high aluminium obelisk at 59°59′57.98511″N 102°00′27.24027″W﻿ / ﻿59.9994403083°N 102.0075667417°W﻿ / 59.9994403083; -102.0075667417﻿ (Four corners)Coordinates: 59°59′57.98511″N 102°00′27.24027″W﻿ / ﻿59.9994403083°N 102.0075667417°W﻿ / 59.9994403083; -102.0075667417﻿ (Four corners) (NAD83), inscribed to say it was erected in 1962. This location is about 400 metres (1,300 ft) away from the meridian of 102°W. On the top of the obelisk there is a disc warning of five years imprisonment for removing or destroying the monument. The establishment of Nunavut in 1999 led to the creation of Canada's only quadripoint at this location. In the legal definition of Nunavut, its border is specified as "Commencing at the intersection of 60°00'N latitude with 102°00'W longitude, being the intersection of the Manitoba, Northwest Territories and Saskatchewan borders". Since the intersection does not lie exactly at those coordinates, the laws are not perfectly clear about whether or not the Nunavut–NWT boundary, which has not been completely surveyed, is to meet the others in a quadripoint. Surveys began in 2011. Four Corners Monument, a surveyed quadripoint in the United States which also has a monument. ^ a b Hill, Tony L. (2002). Canadian politics, riding by riding: an in-depth analysis of Canada's 301 federal electoral districts. Minneapolis: Prospect Park Press. p. 448. ISBN 978-0972343602. ^ a b c "Nunavut". Welcome to Canada. Canadian Tourism Development Corporation. Archived from the original on October 19, 2013. Retrieved February 20, 2015. ^ a b c Butler, Brian J. 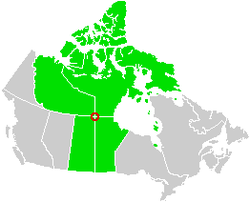 "Manitoba - Northwest Territories - Nunavut - Saskatchewan Multi-point". The Corner Corner. BJB Software. Retrieved May 13, 2013. ^ "Laying the Groundwork for Property Rights and Development" (PDF). Saskatchewan Land Surveyors Association. Retrieved May 13, 2013. ^ "Nunavut Act SCHEDULE I (Section 3) WESTERN BOUNDARY OF NUNAVUT". Canadian Legal Information Institute. 1993. Archived from the original on December 28, 2005. Retrieved January 13, 2007. ^ "Nunavut Act SCHEDULE I (Section 3) WESTERN BOUNDARY OF NUNAVUT". Government of Canada Justice Law Website. 1993. Retrieved January 31, 2013. ^ "Trans-boundary Mineral Claims and Leases". The Plan: Proposed Regulatory Changes and Map Selection in Nunavut. Aboriginal Affairs and Northern Development Canada. October 1, 2012. Retrieved January 31, 2013. ^ "N.W.T.-Nunavut boundary being surveyed". CBC News. June 23, 2011. Retrieved January 31, 2012. ^ "NWT-Nunavut border under the microscope". APTN National News. June 28, 2011. Archived from the original on April 29, 2013. Retrieved January 31, 2013. This page was last edited on 14 August 2018, at 00:20 (UTC).